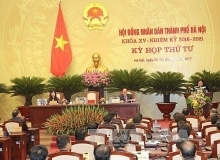 (VEN) - As the country’s first export- processing zone, Tan Thuan Export Processing Zone (Tan Thuan EPZ) has significantly contributed to the development of Ho Chi Minh City (HCMC) and given important lessons in practical development of industrial parks (IPs) and EPZs in the country’s industrial development. (VEN) - Prime Minister Nguyen Tan Dung attended and delivered an important speech at the Vietnam Development Partnership Forum chaired by the Ministry of Planning and Investment and the World Bank Vietnam in Hanoi. (VEN) - Vietnam has 289 industrial zones (IZs), of which 184 have begun production and or trading activities and others are under infrastructure construction. While IZs contributed greatly to economic development they achieved a modest occupancy rate of 60 percent. (VEN) - On the threshold of the Vietnam Development Partnership Forum (VDPF) scheduled to take place on December 5, 2013, the Ministry of Planning and Investment held the 7th Aid Effectiveness Forum (AEF 7) on enhancing the effectiveness of aid for sustainable development on November 26 in Hanoi. (VEN) - Vietnam created a breakthrough in attracting foreign direct investment (FDI) in the first 11 months of this year, contributing to affirming attractiveness of the country’s investment environment and efforts in improving its environment. (VEN) - With many advantages in terms of location and complete infrastructure, Dat Cuoc Industrial Park in Binh Duong Province, invested by Binh Duong Minerals And Construction Joint Stock Company (BIMICO) has rapidly attracted a large number of investors. Vietnam Economic New’s Thu Duyen had an interview with Deputy Director of BIMICO Pham Van Hiep.